He has lived in exile in France since 1975, having become a naturalised citizen in 1981. Milan Kundera wrote his first poems during high school. After World War II, he worked as a tradesman and a jazz musician before beginning his studies at Prague’s Charles University where he studied musicology, film and literature and aesthetics. After graduating in 1952, Kundera became assistant and later professor with the film faculty at Prague’s Academy of Performing Arts, lecturing in world literature. During this time, he published poems, essays and stage plays and joined the editorial staff at the literary magazines “Literarni Noviny” and “Listy.” Kundera joined the communist party in 1948 full of enthusiasm, as did so many intellectuals. In 1950, he got expelled from the party due to individualistic tendencies but rejoined from 1956 to 1970. Throughout the 50s, Kundera worked as a translator, essayist and author of stage plays and, in 1953, he published his first book. His first novel, “The Joke,“ written in 1967, deals with Stalinism. After the Soviet invasion on the 21st of August, 1968, Kundera, as one of the leading figures of the failed radical movement the “Prague Spring,” lost his teaching position and his books were banned from libraries the country over. In 1970, his books were banned from publication. His second novel, “Life Is Elsewhere”, was published in Paris in 1973. In 1975, Kundera became guest professor at the University in Rennes in Bretagne, France. He was deprived of Czechoslovakian citizenship in 1979 in reaction to his “Book of Laughter and Forgetting.” The novels that followed were banned from publication in the CSSR. He gained his French citizenship in 1981. Since 1985, Kundera has given only written interviews, feeling himself often misquoted. In 1986, Kundera published his first work written in French, the essay “L'Art du Roman“ (The Art of the Novel). In 1988, he published his first novel written in French, “Immortality.” Having been a lecture in comparative language sciences at the University of Rennes for several years, in 1978 Kundera became an author with the noted publishing house Gallimard. 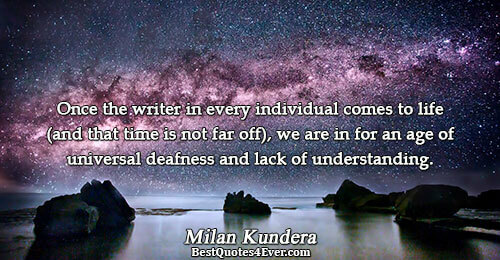 Not only are Kunderas books classics of the 20th century, Kundera is among it’s greatest novelists. Unlike many more public authors, He lives virtually incognito and rarely speaks to the media. 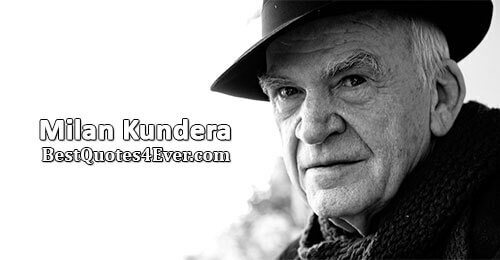 A perennial contender for the Nobel Prize in Literature, he has been nominated on several occasions Kundera currently lives with his wife, Vera Hrabankova, in Paris. The Owner of the Keys, 1962. 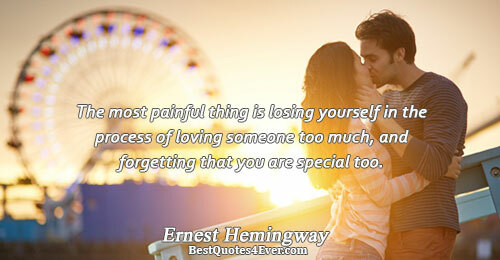 And therein lies the whole of man's plight. Human time does not turn in a circle; it runs ahead in a straight line. That is why man cannot be happy: happiness is the longing for repetition.